Andronikos II Doukas Angelos Palaiologos was born 25 March 1259 in Nicaea, Byzantine Empire to Michael VIII Palaiologos and Theodora Palaiologina and died 13 February 1332 in Constantinople, Byzantine Empire of unspecified causes. He married Anna of Hungary (1260–1281) . Andronikos II Palaiologos (Greek: Ἀνδρόνικος Βʹ Παλαιολόγος; 25 March 1259 – 13 February 1332), usually Latinized as Andronicus II Palaeologus, was Byzantine emperor from 11 December 1282 to 23 or 24 May 1328. Andronikos II was born Andronikos Doukas Angelos Komnenos Palaiologos (Greek: Ἀνδρόνικος Δούκας Ἄγγελος Κομνηνός Παλαιολόγος) at Nicaea. He was the eldest surviving son of Michael VIII Palaiologos and Theodora Palaiologina, grandniece of John III Doukas Vatatzes. Andronikos was acclaimed co-emperor in 1261, after his father Michael VIII recovered Constantinople from the Latin Empire, but he was not crowned until 1272. Sole emperor from 1282, Andronikos II immediately repudiated his father's unpopular Church union with the Papacy, which he had been forced to support while his father was still alive, but he was unable to resolve the related schism within the Orthodox clergy until 1310. After the failure of the co-emperor Michael IX to stem the Turkish advance in Asia Minor in 1302 and the disastrous Battle of Bapheus, the Byzantine government hired the Catalan Company of Almogavars (adventurers from Catalonia) led by Roger de Flor to clear Byzantine Asia Minor of the enemy. In spite of some successes, the Catalans were unable to secure lasting gains. Being more ruthless and savage than the enemy they intended to subdue they quarreled with Michael IX, and eventually openly turned on their Byzantine employers after the murder of Roger de Flor in 1305; together with a party of willing Turks they devastated Thrace, Macedonia, and Thessaly on their road to Latin occupied southern Greece. There they conquered the Duchy of Athens and Thebes. The Turks continued to penetrate the Byzantine possessions, and Prusa fell in 1326. By the end of Andronikos II's reign, much of Bithynia was in the hands of the Ottoman Turks of Osman I and his son and heir Orhan. Also, Karasids conquered Mysia-region with Paleokastron after 1296, Germiyan conquered Simav in 1328, Saruhan captured Magnesia in 1313, and Aydinids captured Smyrna in 1310. The Empire's problems were exploited by Theodore Svetoslav of Bulgaria, who defeated Michael IX and conquered much of northeastern Thrace in c. 1305–07. 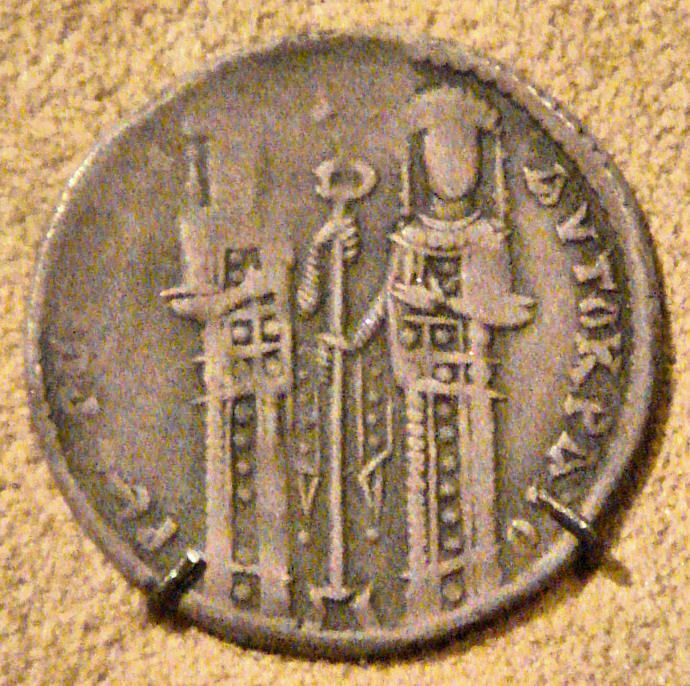 The conflict ended with yet another dynastic marriage, between Michael IX's daughter Theodora and the Bulgarian emperor. The dissolute behavior of Michael IX's son Andronikos III Palaiologos led to a rift in the family, and after Michael IX's death in 1320, Andronikos II disowned his grandson, prompting a civil war that raged, with interruptions, until 1328. The conflict precipitated Bulgarian involvement, and Michael Asen III of Bulgaria attempted to capture Andronikos II under the guise of sending him military support. In 1328 Andronikos III entered Constantinople in triumph and Andronikos II was forced to abdicate. Constantine Palaiologos, despotes (c. 1278 – 1335). Constantine was forced to become a monk by his nephew Andronikos III Palaiologos. John Palaiologos (c. 1286–1308), despotes. Irene, who married John II Doukas, ruler of Thessaly. Maria, who married Toqta, Khan of the Golden Horde. A daughter known as Despina Khatun, who married Öljaitü, Khan of the Ilkhanate. ^ PLP, 21436. Παλαιολόγος, Ἀνδρόνικος II. Δούκας Ἄγγελος Κομνηνός. ^ Agelarakis, P. A. (2012), Cretans in Byzantine foreign policy and military affairs following the Fourth Crusade. Cretika Chronika, 32, 41-78. "Andronicus II.". Encyclopaedia Britannica. 2 (9th ed.). 1878. p. 23. ^ Korobeinikov, Dimitri (2014). Byzantium and the Turks in the Thirteenth Century. Oxford University Press. pp. 212. ISBN 978-0-198-70826-1. Bartusis, Mark C. (1997). The Late Byzantine Army: Arms and Society 1204–1453. University of Pennsylvania Press. ISBN 978-0-8122-1620-2. https://books.google.com/books?id=rUs-hHd89xAC. Chisholm, Hugh, ed (1911). "Andronicus II". Encyclopædia Britannica. 1 (11th ed.). Cambridge University Press. p. 976. Fine, John Van Antwerp (1994). The Late Medieval Balkans: A Critical Survey from the Late Twelfth Century to the Ottoman Conquest. Ann Arbor: University of Michigan Press. ISBN 978-0-472-08260-5. https://books.google.com/books?id=Hh0Bu8C66TsC. Warning: Default sort key "Andronikos 02 Palaiologos" overrides earlier default sort key "Palaiologos, Andronikos". This page uses content from the English language Wikipedia. The original content was at Andronikos II Palaiologos (1252-1332). The list of authors can be seen in the page history. As with this Familypedia wiki, the content of Wikipedia is available under the Creative Commons License.